How can I properly display Marquee images on custom cut LCD screen? The marquee staying up while the game is played should happen. It does in my setup. I cannot assist on the other question as I am not familiar with adjusting the xml at all. I got that to work thank you. As you can see from the picture above , it is showing the wrong marquee for the game selected. I will have to try and figure that out. That issue I am not sure. I know there were some random posts about game images not changing when moving to other games. I have not seen anyone report the same with marquee images and I do not recall seeing it on my cabinet. Yeah, this is what’s happening . As far as size, mine is a 19", which is the top 1/3 of a 21.5" LCD. Really, you just want to figure out the width of your cabinet, and find something that fits. Definitely go smaller if there's no exact fit, you can always make a bezel around it. When you're looking them up, they should show the full dimensions. 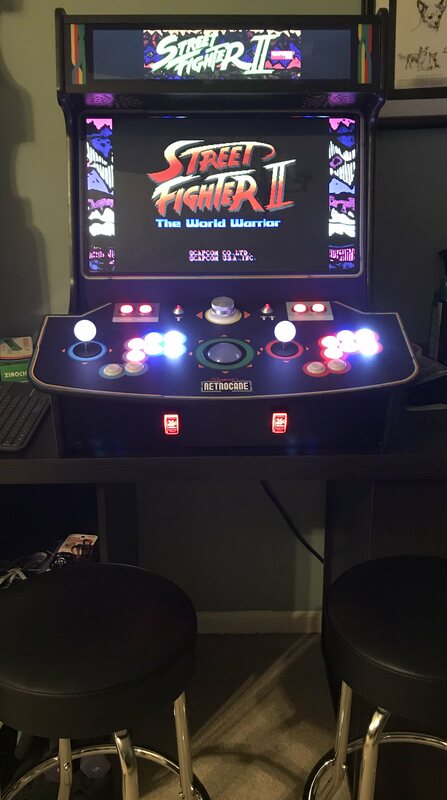 This is what my bartop looks like. If I had the space, I would have used a 1/2 cut instead of the 1/3 as that seems to fit the proportions of most marquees a little better. I have custom platform/playlist marquee images to fill the whole LCD, individual games may just be scaled down. I haven't had the "wrong game shows" issue, it's been spot on for me. I did have to modify the theme files after 9.4 though. The new code is a little cleaner, I'll post it when I get home and have access to the bartop.